India was reduced to 127 for six in the 50th over before Cheteshwar Pujara dug in to compile a 246-ball 123 to bail out the visitors, reaching 250-9 at stumps. On a flat Adelaide surface, the Australian bowlers put in a wonderful show as they restricted India to 250/9 at the end of the first day's play. Mitchell Starc, Josh Hazlewood, Pat Cummins, and Nathan Lyon combined beautifully as they never allowed the Indian batting to break free. The tall left-armer was happy with the performance of the bowlers but did concede that they became a tad untidy towards the end. India were reduced to 127 for six in the 50th over before Cheteshwar Pujara dug in to compile a 246-ball 123 to bail out the visitors, reaching 250-9 at stumps. 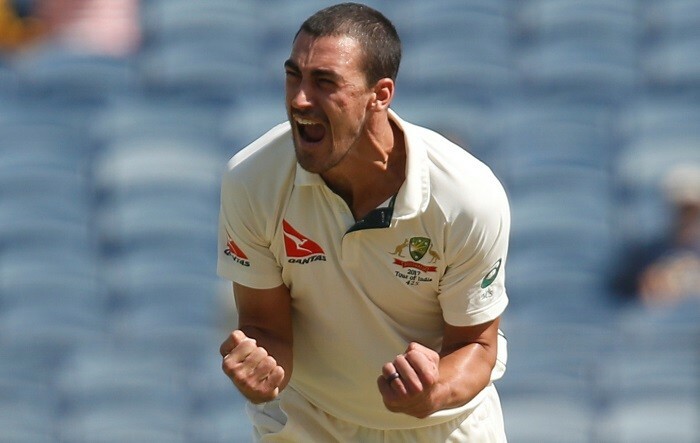 Heaping praise on Pujara, Starc said that the right-hander displayed a lot of patience and played wonderful innings. "Cheteshwar Pujara batted a lot of time. He's someone who likes to absorb pressure and bat a long time, and credit to him he scored a fantastic hundred. I think if you asked us at the start of the day if we'd take losing the toss and India being 9 for 250 at stumps I think we'd bite your arm off," he added. Speaking about the nature of the pitch, Starc, who picked up 2 wickets for 63 runs, said that nothing much could be said about the surface until both teams bat on it. Starc also revealed that they had expected India to go hard up front against the new ball and had made their plans accordingly. He said that they had studied the opponents and stuck to their plans.